Leonardo Cesari is a drummer, composer, producer, and arranger was born July first 1961 in Rome, he majored in “Jazz” at “Licinio Refice” Conservatory in Frosinone. He started shaping himself artistically by a very young age at his father’s school, the legendary jazz pianist Umberto Cesari, with whom in the second half of the 60s, he had the possibility to partake in jam-sessions in his native house of Rome, which was at the time a usual destination for many famous Italian and foreign musicians. “LA BEGUINE DU MAC" Cinevox Record, 1999, “Twist druma” Cinevox Record on first place classification HMV Giappone in 2002 for Rambling Records. "ROOTS AND BASS" di Mario Rivera, Cni, "GIORI" Amia- ta records, 2002, "SIGNORINA ESTIVA" feat. Asha puthli, Cinevox Re- cord, 2004, "SOLO TRIO" feat. Gabriele Coen, Riccardo Fassi, Cni, 2004. With those discs Leonardo experiments with new sounds related to the world of electronics and to the new scene of nu-jazz that in those years appeared in the European music scene, which brings him to collaborate with Andrea Guerra for the realization of the music for the movie " THE PROTAGONIST" by Luca Guadagnino, with Tilda Swinton, 1999, ” LE FATE IGNORANTI" by F. Ozpetek, with Stefano Accorsi, 2001. At the same time he collaborates with many artists, among which the producer Marco Rinalduzzi, Alex Baroni, Valeria Rossi, the M° Fabrizio de Rossi Re, the M° Paolo Pandolfo, the M° Leonardo De Angelis, Marcello Murru in his disc “Bonora” Cni. Leonardo starts an intensive activity of composition and arranging, signing soundtracks for dozens of documentaries edited by RAITRADE working for “Alle talde del Kilimangiaro”, Rai tre, “La storia siamo noi” di Giovanni Minoli, “La repubblica di S. Gennaro”, by Massimo Costa, 2003 " UN AMORE A VENEZIA" with Gedeon Burkhard, 2005, for "RAI QUATTRO" the fiction "GIOCHI SPORCHI" directed by David Emmer 2009, ”COSMO" di Gregorio Paolini, RAITRE 2011 "MI MANDA RAI TRE" RAITRE 2011 presented by Edoardo Camurri, just to cite a few. Meanwhile, his research into the multifaceted ethno-jazz world leads him to become the drummer of “Piccola banda ikona” by Stefano Saletti for 10 years, with whom he goes touring around the world in Spain, Portugal, Azzorre Islands, Canada and naturally Italy. He then became the director of the fortunate theatrical performance “L’Elasticone” with Marco Simeoli as a director. In those same years Leonardo collaborates with other famous jazz musicians such as Ares Tavolazzi, Daniele Pozzovio, Michael Blass, Burt de Norf, Mario Corvini, Claudio Corvini, Carlo Conti, Karri Luhtala, Cicci Santuc- ci, Giorgio Rosciglione, Roberto Tarenzi, Antonello Salis, Alessandro Gwiss, Eric Daniel, Marco Siniscalco, Massimo Nunzi. In those years he develops other important discs as a leader and co-leader: LEONARDO CESARI "Lullabies for E.T. children" Funkyjuice, 2010 "STAND UP ONE MORE TIME" feat. 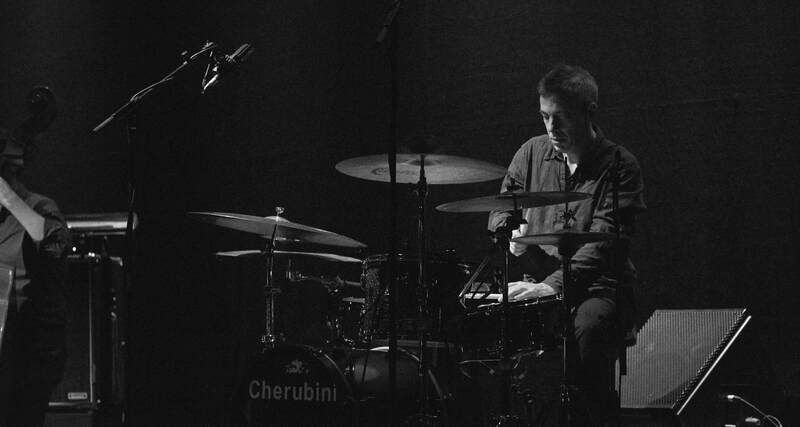 Ares Tavolazzi Egea, 2010 LEONARDO CESARI JAZZ COMBO "Chasing the beat" Funkyjuice, 2011. In 2012 he starts a series of workshops and seminars; his goal is to share with the new generations his 30 years of study and experience. He has been teaching since 2015 at the prestigious Sonus Factory music school in Rome as a Jazz and Latino drum music performance teacher. Copyright © 2019 Leonardo Cesàri | Theme by SiteOrigin.